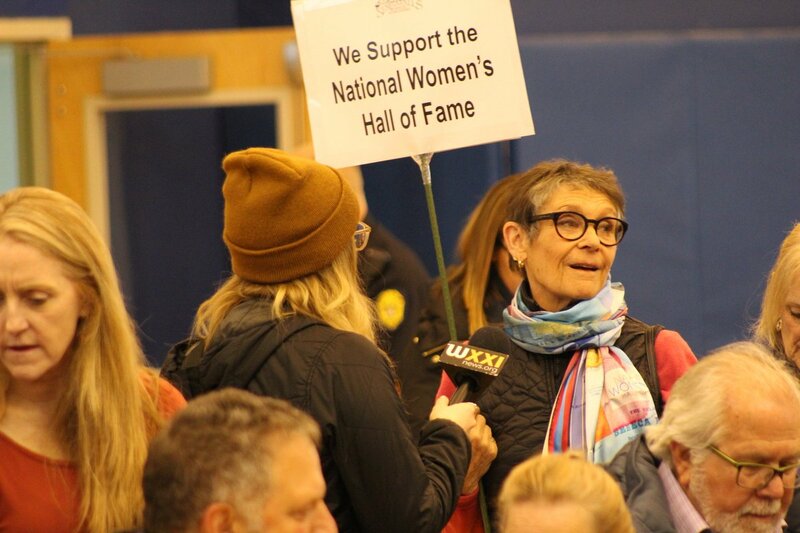 On Tuesday, the Seneca Falls Town Board voted 4-1, with one abstention defeating a resolution that was announced last week by Town Supervisor Greg Lazzaro, which would have prohibited any future financial funding from the Town to the National Women’s Hall of Fame. All due to the induction of Jane Fonda. Several partitioners were listed to offer public comments regarding the Hall of Fame induction. 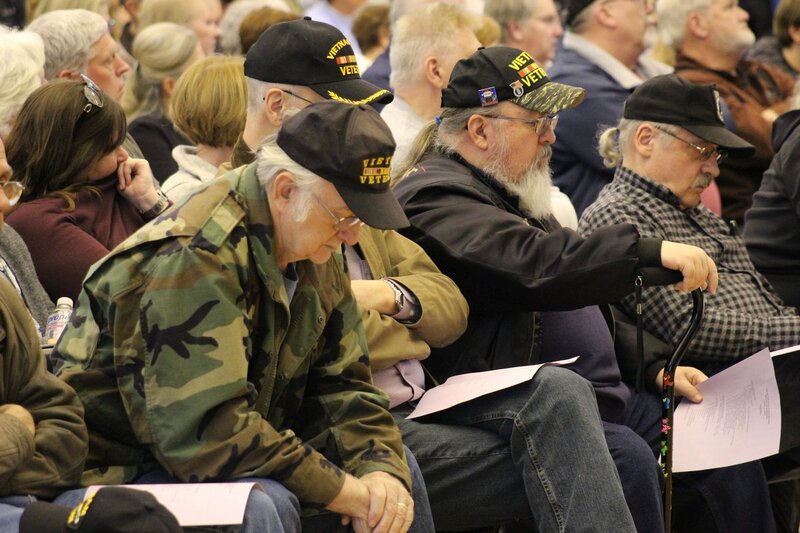 Activists from all affiliations appeared, ranging from veterans of foreign wars to women’s rights advocates. 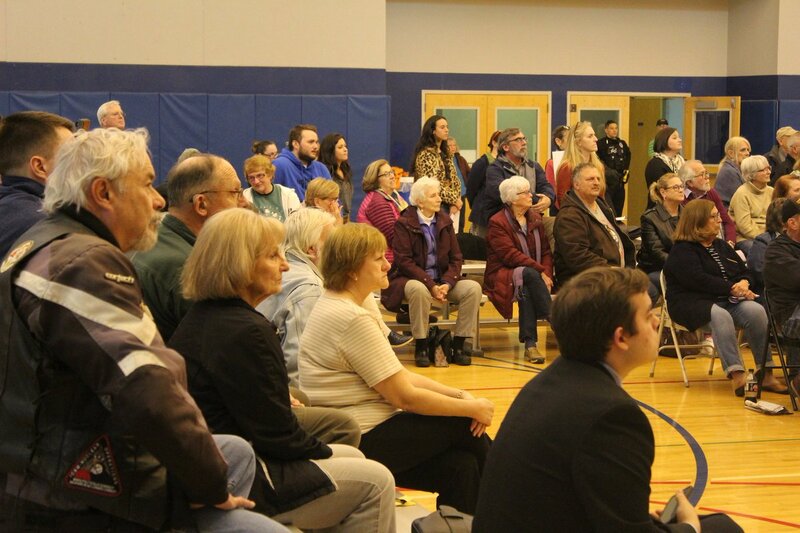 Instead of the meeting taking place at the Municipal Building, the Seneca Falls Community Center was determined as an alternate venue. Seneca Falls Downtown Business Association President, Ann Sandroni led off public comment sharing her disappointment with the town for considering such cuts, merely from a financial position. Betty M. Bayer, former president of the board of the National Women’s Hall of Fame spoke endearingly about the Hall and its strong community-building relationships between the City of Geneva and Hobart and William Smith Colleges by drawing attention to Seneca Falls from college students and tourists traveling through the Finger Lakes. “This is a history that’s rarely told and often less fairly understood,” Bayer said. In her public proclamation, she emphasized her pivotal position and stance on the Hall of Fame being an “independent, nonprofit and nonpartisan” entity, even encouraging controversy and discourse surrounding current and future inductees. “It invites us to question, to dig into what we may or may not know; to grapple with history and with that grappling to use it as a mechanism for us to come to a place where we can find the emotional repair from historical events,” Bayer added. Bayer said the resolution, if passed, could have led to future unintended consequences that disproportionately affected the economic viability of the community at-large. On a separate note, in Bayer said matching the financial costs to qualify for the Restore New York grant was commonly held as the mutual commitment between the Town of Seneca Falls and Women’s Hall of Fame, long before Lazzaro was ever elected. “The only way you can get that grant is for you to do something for your municipality that will build it,” Bayer noted. The $278,750 outlined in the resolution reflected a 10 percent match by the Town for grant funding in the millions, which the Hall of Fame made the Town of Seneca Falls eligible to receive. With that initial investment, the Hall of Fame turned it into $8 million of investment to cover restoration efforts for the historic Seneca Knit. That building is nearly complete. Even as recently as last year, the Hall of Fame secured $150,000 for the mill restoration project on behalf of Seneca Falls. Bayer still urged everyone to join them at the hall to engage in intuitive, meaningful conversations and dialogues. “Honor women with whom you have much in common and those with whom disagree but remember in the end they have all pushed and prodded us, sparked our imagination and compelled us time and again to envision a kind of world where we might live well together in all of our differences,” Bayer concluded. After recently becoming president on behalf of the Women’s Hall of Fame, Kate Bennett spoke with strength and conviction in an attempt to tie the community together. “And we will be a stronger community if you will support our existence as well as our 50-year proven method of choosing inductees,” Bennett said. Bennett publicly disclosed that the selection process for inductees manifests as a separate electoral process that has not been directly decided upon by board members but rather determined through a voting process by the general public. “This was a woman of many accomplishments,” Bennett continued, speaking of Fonda. In contrast, other viewed the resolution as a vote on the person, Jane Fonda, herself and past actions. 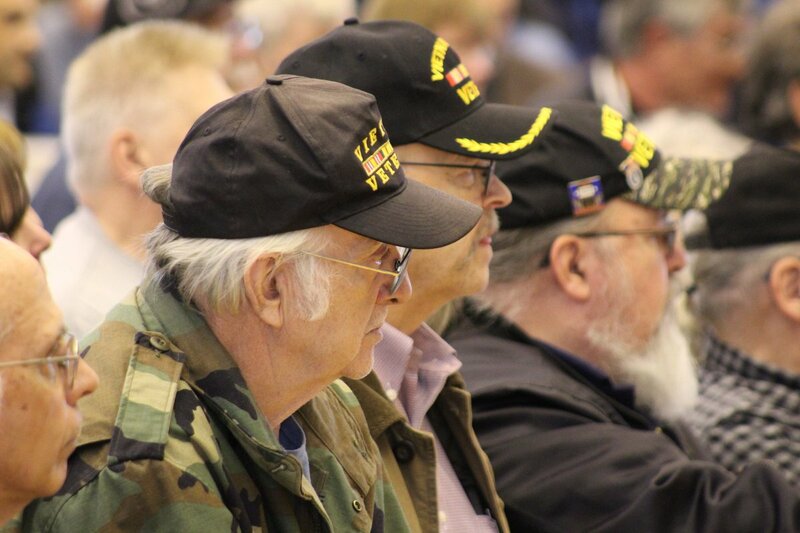 VFW Post 1323 Commander David Ostroski, a Seneca Falls resident and Vietnam War veteran sought for his fellow former servicemen to promote a unified front on this issue by calling upon their support. “We need to stand together,” Ostroski said. Bringing blame to Fonda, Ostroki questioned her concern for troops. “I lost my best friend. We lost over 50,000 … She didn’t care about us,” he continued. Supervisor Paul Kronenwetter (R-Seneca Falls) who serves on the County’s Board of Supervisors said he opposed the inductions of Angela Davis and Fonda. “It was really hard for me to understand all with all of the strong, innovative and talented women we have in this great country, groundbreaking discoveries, civic leaders, leading scientists, the nominating committee come up with a communist terrorist and a traitor: Angela Davis,” Kronenwetter said. He went to further length citing her unjustified reasonings as to why the internationally-recognized political activist, academic and author should not be accepted. Once Kronenwetter finished his remarks, a young woman walked down the center aisle shouting and protesting. She was then temporarily escorted out of the room by two police officers on-site. After the final speaker finished their comments, Supervisor Lazzaro opened the floor for an additional period of time for public discourse prior to a brief recess and eventual vote decision. Additional members of the public who were not originally slated to speak were given an opportunity to provide opinions for the public record. “This petition is about Jane Fonda. I truly believe that we have to stand strong together and vote yes on this resolution and no on Jane Fonda,” Lazzaro concluded. Councilmen Lou Ferrara, Doug Avery, and Vic Porretta voted against the resolution, despite Supervisor Lazzaro’s request. Councilman Dave DeLelys abstained from voting, citing a vague conflict on the matter. Despite that, DeLelys’ vote counted as a ‘nay’ in the overall count. At that moment, the resolution was defeated by a 4-1 count – ending the possibility of any such resolution being adopted in Seneca Falls.